Snow. I got some snow a few days ago. I saw the snow begin to fall the night before and knew that the forecast was calling for more. Despite having stayed up late, I got up early next morning. Eureka! No work. Good snow. -11 C. Perfect. I made my way to bike paths that were the direct opposite of my commute routes. The snow was fresh, there were some footprints but no bike tracks, and everything looked beautiful, at least to me. Riding in powder is kind of like running in sand. It feels good, but it is tiring. I overdid it, riding in the deep snow and working harder than I have in a very long time. I have read about serious cyclists "bonking" during a ride. You may have noticed how slowly I was riding near the end of that video. Shortly after that, I bonked. In my excitement to get riding I had skipped breakfast and that hurt me for sure. My version of bonking included getting off the bike and walking because I was afraid my heart might explode and losing the helmet and goggles because I was overheating badly. After catching my breath, I was able to ride for about 20 more minutes in the deep stuff. I hope none of the birds were offended. I rode the return leg home on the street, which seemed ridiculously easy compared to the trail. 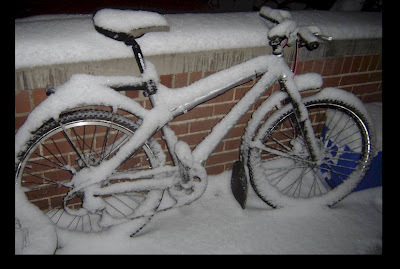 It had re-schooled me in bike handling on snow in a hurry. Another big snowfall is happening as I write this on New Year's Day. I am looking forward to the challenges of street commuting now that winter has finally arrived in London Ontario. Happy New Year everybody! That was perfect music for your first video. I'm sure Pachelbel must have had a similar experience in mind when he wrote it. Big Oak - yeah, that's my favourite piece of royalty free music; I've used it before. I also enjoy the mental image of Pachebel riding Mutant Winter.